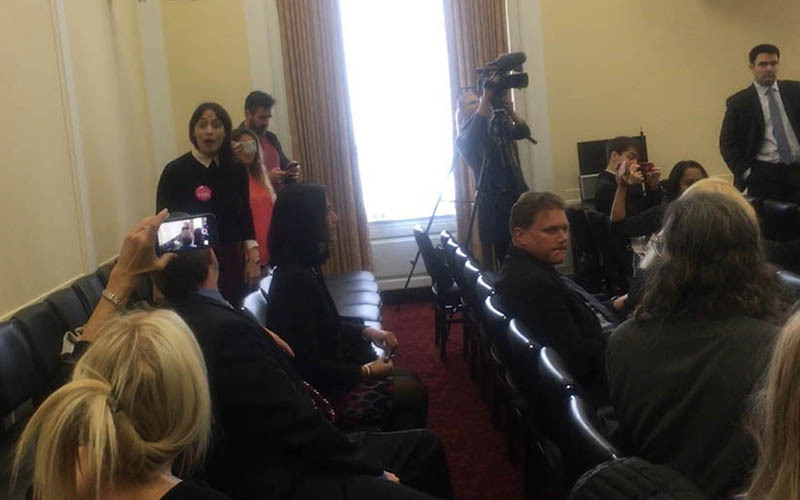 WASHINGTON - Rep. Paul Gosar, R-Prescott, had to call Capitol Police after protesters disrupted a forum he joined with right-wing groups - groups the protesters called racists and extremists - complaining about their social media access being restricted over comments on immigration and Islamic law. WASHINGTON - Scottsdale eighth-grader Akshaya Venkatesh saw a problem - food waste - and developed what she thinks might be a solution, a phone-based app to connect groups that need food with those who have too much. That work made her one of 30 finalists in a national science fair for middle schoolers. A California Institute of Technology scientist and his colleagues worked on an algorithm that enables a single self-guided drone to herd a flock of birds away from an airport. TEMPE - Arizona designer, entrepreneur and professor Galina Mihaleva is merging biology, technology and fashion in her most innovative and sustainable idea yet - kombucha couture, fashion designed from a sustainable textile. Sun Devil Stadium is close to becoming a community union equipped with restaurants, a running track and classrooms. WASHINGTON = Robocalls skyrocketed for every area code in Arizona in the first half of this year, reaching 78.3 million calls in June alone, according to a new report that said the state mirrored a national spike, where robocalls totaled 4.1 billion for June. WASHINGTON - When Twitter purged suspicious accounts last month, almost every member of Arizona's congressional delegation saw his or her followers drop, but the hits were small and experts say they will likely have little long-term impact, with some accounts already rebounding. A group of researchers is fighting online hate speech by teaching computers to recognize it on social-media platforms. WASHINGTON - The Arizona chapter of American Civil Liberties Union withdrew a lawsuit it had filed against Rep. Paul Gosar, R-Prescott, after he blocked two constituents from his social media accounts, with both sides claiming victory in the dispute. These sheep work for food, eating mesquite and tall grass at a solar farm that powers 20,000 homes in southern Arizona. Livestock landscapers can be used to trim the land around freeways or cut down on the brush that feeds wildfires. Before new technology can be used in the aviation industry, the FAA requires it be put through strict testing measures for certification.